The University of Oregon's Lundquist College of Business offers its signature executive MBA program in the heart of Portland. Executive MBA programs are designed for accomplished mid-to-senior managers, executives, entrepreneurs, and business leaders who want to work full time while earning a graduate degree in two years or less. Executive MBA programs cater to midcareer professionals positioning themselves to move up the corporate ladder by deepening their already broad knowledge base, by sharpening their skills, and by tackling problems their organization will face in the coming years. The Oregon Executive MBA is a transformational experience that gives already accomplished professionals the confidence and skill to become successful leaders in today’s complex and global business world. Collaborating with your cohort of talented peers and learning team is one aspect of the Oregon Executive MBA experience. Getting an insider perspective from leaders in business, government, and nonprofit organizations who visit the program is another aspect. Global Study trips, networking with other executive MBA students and alumni, and forging new bonds with unexpected contacts complete the package. The following are some of the key characteristics of the Oregon Executive MBA student experience. At Oregon Executive MBA, we believe one word pervades our learning every day: Innovation. We promote innovation in students’ core business knowledge, in the way they approach problems, and in the way they persuade others to join them in solving difficult business questions. By viewing business education through this lens, each class is transformed into an exercise in how to do things differently from the norm. Our faculty are a combination of academic leaders from the University of Oregon and skilled practitioners who have worked at Oregon’s most prominent and influential companies. First-year courses concentrate on the groundwork essentials of marketing, finance, and statistics, while second-year courses focus on application, business problem analysis, and innovation. The combination of foundational knowledge and innovative thinking will transform the way you look at business—both old and new. Ask any Oregon Executive MBA alum what they value most from the program, and they’ll mention the faculty, the coursework, and the executive coaching. But undoubtedly, the most important aspect of the executive MBA experience is “the cohort”—the thirty-five to fifty executives on a journey of knowledge acquisition and personal growth. The bonds students create with their peers in the classroom, on the global study trip, during team sessions, on Friday evenings, and at study groups is a key part of what they take away. After graduating, our executive MBA alumni continue to rely on classmates—as well as faculty—for help in applying concepts learned in new ways. The cohort experience creates a rich environment for learning. At the start of the program, each student becomes a member of a learning team of four to six. Oregon Executive MBA staff carefully construct the groups to include diverse—but complementary—professionals from a variety of organizations, industries, and functional areas. The objective is for each group to leverage the various strengths and frameworks of its members—and for the whole to be greater than the sum of its parts. We've found that team projects allow students to delve more deeply into the subject matter while also allowing them to take on more complex assignments. Many of our students also discover that, in addition to the academic benefits of team work, they gain an amazing group of peers that can help support one another with regard to school, work, and home. 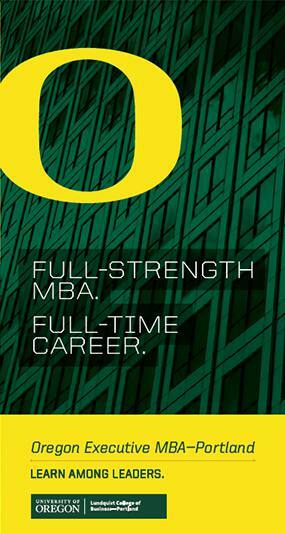 The Oregon Executive MBA has major benefits, but it is also a major commitment. Balancing work, family life, and an MBA program can be difficult to manage. However, executive MBA students at many different stages of life make the program work with their families, partners, and jobs. Our program is designed for professionals with demanding schedules. The format minimizes time away from work and family by scheduling classes so that only eight hours per month overlap with the typical work week. If students are required to miss a class, all sessions are live-streamed for your convenience. Classes are offered twice a month on consecutive Fridays and Saturdays. On Fridays during the first year, classes start at 11:45 a.m. and finish at 8:00 p.m. During the second year, Friday classes begin at 1:00 p.m. with an 8:00 p.m. finish. Saturday classes during both years begin at 8:00 a.m. and finish at 5:00 p.m. Most of our students have partners and children at home and we are happy to arrange for executive MBA applicants to talk with a student who has similar family responsibilities. They will share how they make it work. We also encourage interested individuals to bring partners with them to an information session to learn more. To make life easier for our busy executive students, our staff additionally takes care of the details behind the scenes, from pulling together your textbooks to registering you for courses. They are always responsive and accessible. Students at the Oregon Executive MBA don’t wait until graduation to apply concepts and ideas from class to their jobs—they do so from the earliest days in and throughout the twenty-month program. Our students report that what they learn on Fridays and Saturdays is put to use immediately when they return to work on Monday, translating into an immediate return on investment for them and their employers. Welcome Event: The first chance new Oregon Executive MBA students have to get to know their cohort and team. Incoming students enjoy a food and a cocktail reception and meet peers, staff, faculty, and alumni. Guest alumni speakers reflect on their program experience and share advice and strategies for making the most of the Oregon Executive MBA. Executive Immersion: The twenty-month program begins with a four-day Executive Immersion at the program's facilty in Portland and at the University of Oregon in Eugene. This enables incoming students to gain a firm grounding in the basics of business school. Global Study Trip: The Oregon Executive MBA offers an extraordinary opportunity to visit businesses overseas and meet executives doing business on a global scale. Students spend approximately seven to ten days abroad working closely with companies on real-life case studies, touring facilities, experiencing new cultures, and meeting with executives from all over the world. Students entering the program in fall 2018 will travel to Singapore in September 2019, with a choice of an additional destination in Thailand, Malaysia, or Vietnam. Class Networking: Students have plenty of opportunities to network with the other cohort in residence at the Oregon Executive MBA through social events and social media. Career Resources: Customized career guidance sessions and up to four executive coaching sessions help facilitate professional advancement. Lunch Speaker Series: At lunchtime, the first-year class tradition sees students present on their lives away from the Oregon Executive MBA. In the second year, student-initiated guest speakers from a variety of companies speak about various aspects of business. Alumni Events: Throughout the year, the Oregon Executive MBA Alumni Association hosts events, including a speaker series and various happy hours and social events. Lifelong Learning: And learning does not stop with a degree. Our alumni are always welcome to audit regular classes as many times as they like. Additionally, the program offers an annual slate of electives at a greatly reduced fee for alumni. 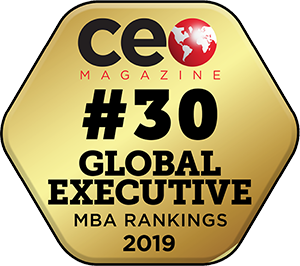 We are delighted to report that CEO Magazine named the the Oregon Executive MBA #16 in the U.S. and #34 worldwide in its Global Executive MBA rankings. If you’re eager to explore the expanded perspective and range of opportunities the Oregon Executive MBA offers, we invite you to register for an information session and tour our facility. The Oregon Executive MBA's total estimated tuition for students entering the fall 2019 cohort (Class of 2021) is $81,000*. The University of Oregon's total estimated fees for students entering the fall 2019 cohort are $2,900*. *Program tuition and university fees will be finalized by Oregon's Higher Education Coordinating Commission in the spring of 2019. Program fees include instructional fees, lodging and most meals during Executive Immersion (single occupancy), dinner on Friday class days, continental breakfast and lunch on Saturday class days, and most on-the-ground expenses of the required international trip that occurs at the start of the second year. 19 percent have masters' or professional degrees. More than 493 organizations have endorsed more than 1,000 students to participate in the Oregon Executive MBA program since its inception in 1985. The University of Oregon and the Oregon Executive MBA are accredited by the Association to Advance Collegiate Schools of Business (AACSB), the highest accreditation standard for business schools internationally.